Part of keeping joy in your life is acknowledging those tiny little everyday things that bring you happiness. Each day, these little moments can become flickering fireflies of delight. When you begin noticing them, they can collectively produce a glow that you could, theoretically, read a nice fairy tale by. The source of my inspiration this week is this lovely blog article by one of my first favorite bloggers, Kylie. Check out her blog here. Today, one of my tiny little pleasures is simple: chocolate. I’m sure everybody at some point has thought of writing an ode to chocolate. At some time in your life, there just is nothing better than warm, melty, rich, creamy goodness on your tongue. 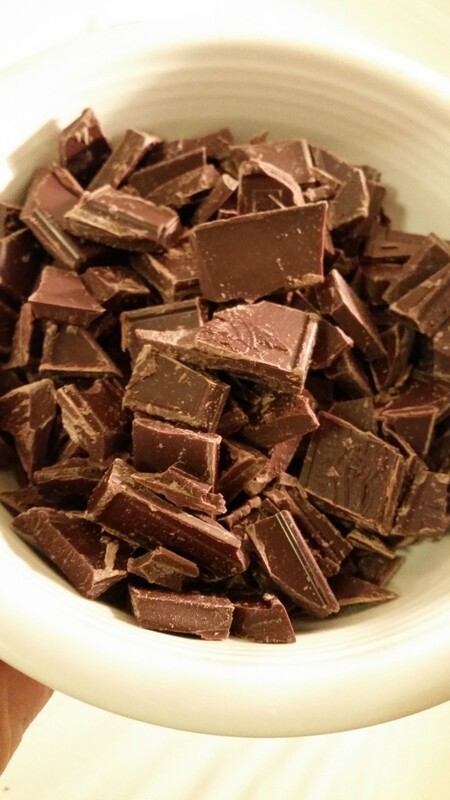 When I was confronted with the need to produce a dessert for a picnic lunch, I immediately thought of making some delightful chocolate concoction. 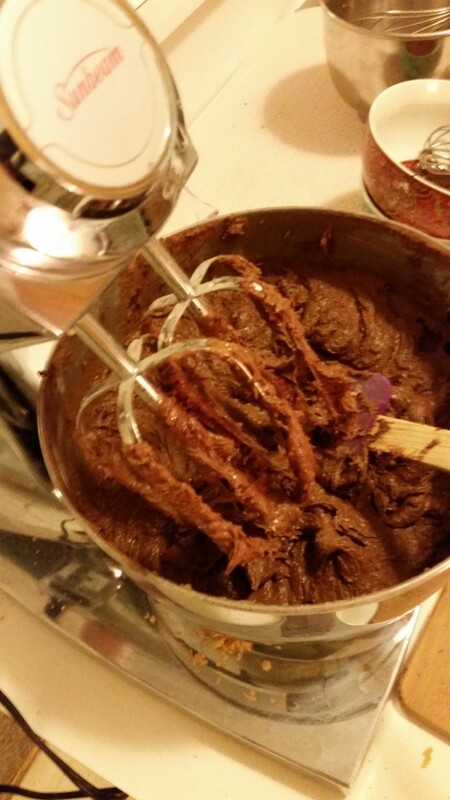 My thoughts turned to this recently-pinned recipe for Triple Chocolate Fudge Cookies. I’m not sure how all of you are feeling this week, but my week has been a bit (A LOT) exhausting. Call it third-week-syndrome, call it the weather, say what you will. This is the time of the semester when we are all settling into our (heavy) course loads, preparing for the first round of tests, performing in our first concerts of the season, and, unfortunately, getting sick. After a long, tiresome week, I decided that I needed to get my booty back in the kitchen and make some magic happen. I am so glad I did. 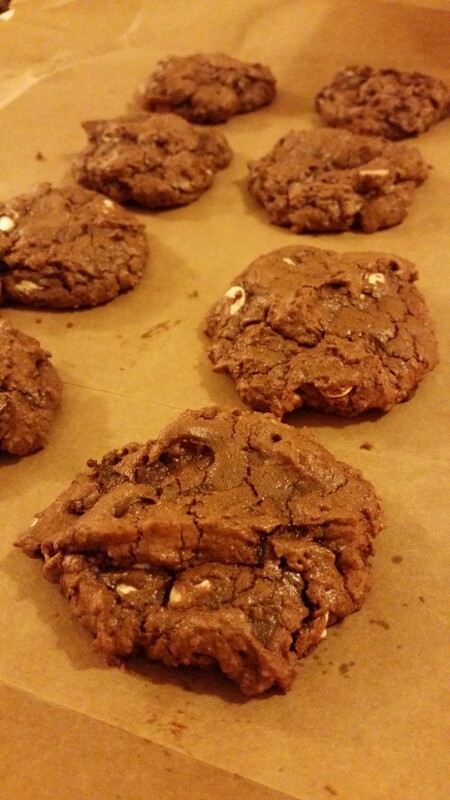 As I prepared the batter for these scrumptious cookies, I felt myself relaxing. I slipped completely into the moment, enjoying the way that cocoa powder fades into flour when whisked. 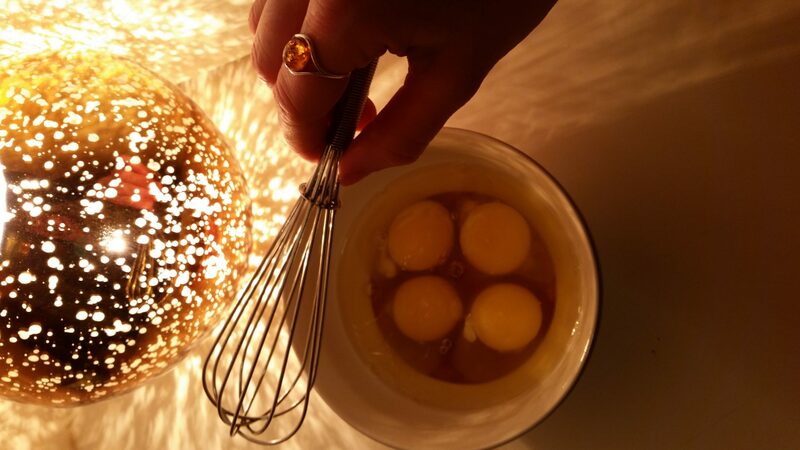 Feeling the sloppy way eggs beat together with a fork. Carefully and lovingly chopping baker’s chocolate bars and melting them ever-so-slowly, stirring the pieces magically into melted goodness. Is there really anything better than melted chocolate? 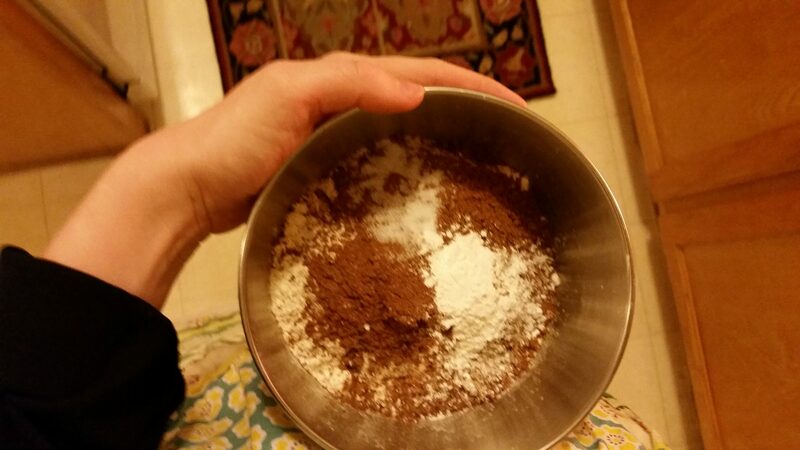 Mixing up this batter, I found myself thankful for traditions. For stability, security, and ease. 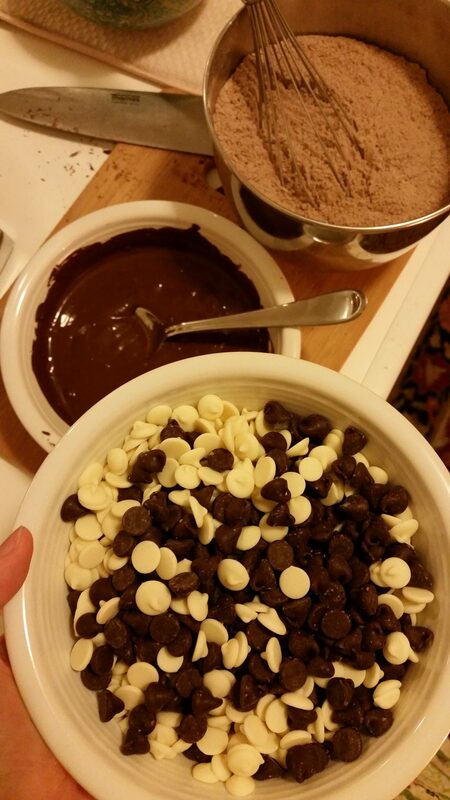 Cookies always mix the same way. Wet with wet, dry with dry, add them all together in just the right order. I love the way my hands know exactly which bowls to reach for without even consulting the recipe. 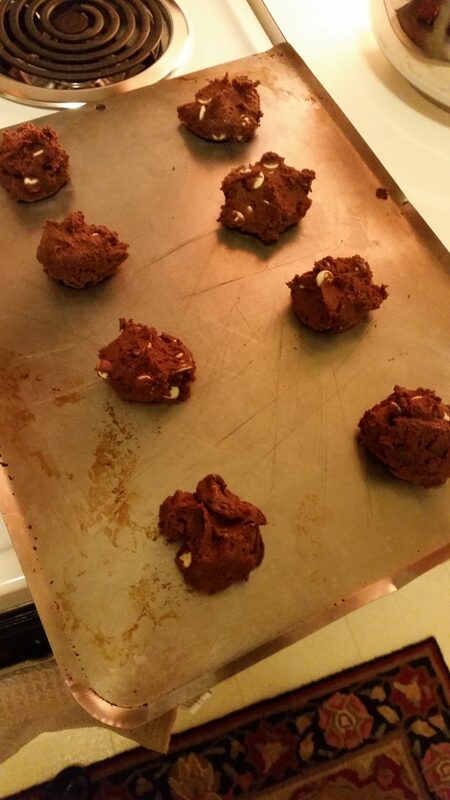 Baking cookies is relaxing for the mind, delightful for the senses, and good for the soul. I would highly recommend you take part in this activity in the near future. Aw, Mandi! I’m delighted that I had a small part in encouraging such chocolatey deliciousness. Those look SO good. Nomnom!